What characterizes exceptionally gifted individuals? Originally written in June 2007. Updated in December 2016. This article is about exceptionally gifted people. Although IQ tests were developed to measure intelligence, IQ is not the same as intelligence, as explained below, although they do correlate to some extent. It is important to understand that when it comes to human psychology nothing is ever 100% 'proven' or fixed. The following are well-established patterns of traits that have been observed in many different cultures over decades, and have been shown to correlate with high IQ most of the time. Numerous studies have shown that IQ is strongly hereditary, that children with highly educated parents also tended to have higher IQ's, and especially that male hormones significantly increased IQ (because IQ only tests typically male reasoning skills, like logic and spatial skills). Other studies reported that the higher the IQ, the bigger the gap in numbers between men and women (Colom & Lynn 2004, Nyborg 2005 and Jackson & Rushton 2006). Because IQ is so intricately linked to male hormones, it is normal to see a correlation between very high IQ and masculine social behaviour. The higher the IQ, the higher the sense of individuality and the independence of mind. Exceptionally gifted people care (much) less about what other people think of them, and are less sensitive to praise, and even less to flattery. Because they care less about the opinion and esteem of others, they tend to be less socially oriented, but also feel less easily lonely. Maybe it is because they have a very heightened sense of the "self". They feel pressed to tell openly what they think to others, especially when they hear something that conflicts with their reasoning or knowledge. They value more truth, facts and logic than friendship or emotional relations. Gifted people therefore only care about social conventions they agree with, and (harshly) criticize the others. They live in an inner world where anything that is not rational is wrong and should be changed. It is unconceivable to them to bask in mediocrity. They are born perfectionists (for what they care about). Their disregard for conventions, combined with vivid, creative and independent mind, often make them coin new words (often just for fun, to see the reaction of those who care about conventions), or use rare words (not by pedantry at all, but just because they like them better). In other words, they recreate the conventions for themselves. Typical high-IQ people are constantly thinking about something, worried about a problem, thinking about solutions... So they end up having little time and energy left, and little motivation, for ordinary chit-chat. Because they are constantly "navigating in their thoughts", they tend to be more forgetful of trivial things ("damn, I forgot to remove the clothes from the washing machine last night!"). Their strong independence of mind and deep intellectualisation of things results in exceptionally gifted people having stronger individual interests than average ("passions" for some topics or activities). Once they get into something, they want to know everything about it (which can make them look like geeks or freaks to ordinary folk). High IQ correlates strongly with exceptional concentration abilities. The problem is that it makes such people quite stubborn until they know or understand what they wanted. Such children are known for always asking "why" questions, and never give up until they get a satisfactory answer. One thing that normally irritates people with high IQ is asking them to explain something (complex), then stop listening in the middle of their explanations. Exceptionally gifted people just can't understand why one would ask a question and not care about the answer, when they visibly do not understand that topic. At school, exceptionally gifted children are easily bored by lessons, because they understand before everyone else and get irritated when the teacher has to repeat for slower people. If it is a subject they are particularily interested in, they usually have learned everything by themselves before, which can create conflicts with the teacher, as gifted children do not mind correcting the teacher's slightest mistake in front of the whole class (that's their way of showing that they shouldn't be sitting in that class in a humiliating position of inferiority - well, you know how wild and vain kids can be !). On the whole, exceptionally gifted people tend to be hyperactive, eat a lot and sleep a lot (because the brain uses so much energy), or on the contrary eat and sleep very little (these are exceptions, like Napoleon, probably due to a different metabolism). High-IQ people are very individualistic, but they usually strive for the common good (as well as their own interests). Their passion for things, their sense of logic, and their desire for perpetual improvement, make of them good politicians and philosophers. On the other hand, they usually dislike routine jobs, with predefinied tasks and little space for creativity and a sense of intellectual challenge. Given their individualism, they rarely bear the authority of other people, and are therefore more often self-made people, free-thinkers and entrepreneurs, rather than conventional academics or professionals employed by a company. Having a high IQ has little influence on most of the arts, as IQ only testes rational, logic and spatial skills. It may help for sculpture (spatial skills), or classical music (rational and spatial). No. There are many types of intelligence: logic, mathematical, analytical, critical, organizational, spatio-visual, linguistic, musical, social (e.g. understanding the way people interact), psychological (e.g. understanding how the human mind works and why people act the way they do), philosophical, and so on. These can be further differentiated. Some people are great orators, but poor writers. Others uses their mother tongue sublimely but are terrible at learning foreign languages. Others still have a perfect command of grammar, but can't imitate accents, or vice versa. Athletic abilities are a subtype of visuospatial abilities, but obviously not the same as the one that makes you understand geometry, which is also different from the one you use to play video games, or to draw a world map from memory, or to park your car. Intelligence is one person's average 'score' for all categories of the human intellect. 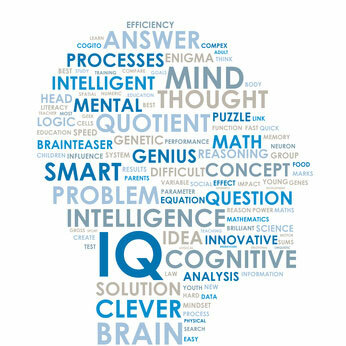 Although IQ means 'Intelligence Quotient', it is a scale that only takes into account some types of intelligence, including logic, mathematical, analytical, spatio-visual skills for non-verbal IQ tests, and some language skills (vocabulary and grammar in one language) for verbal IQ tests. IQ tests do not take into account memory (other than short-term working memory in some tests), critical thinking, creativity, organizational skills, social skils, musical aptitudes, and so on. Nevertheless, there are genes that influence the whole brain plasticity and should therefore increase all types of intelligence. But some genes do grant special abilities in one field too. Some personality traits, such as high intellectual curiosity and open-mindedness, and the to exceptionally gifted individuals. Is there a big difference between an IQ of 140 and 160? IQ test are only reliable until about 130. There are special tests designed for high IQs, but past 150 it's hard to really know who is smarter than whom. There are also many specialized IQ tests (spatial, visual memory, logical, arithmetical, verbal), and people rarely score evenly in all. The problem with most logic tests is that they only deal with simple problems, not complex ones involving pages of data to mentally sort out before computing. The higher the IQ and the better people tend to be at analyzing and finding patterns in large amounts of data. Chimps are faster than humans at some basic problem solving, but cannot deal with high-level complexity problems like humans. Do people with the highest paid jobs typically have the highest IQ? Usually not. High IQ societies have noticed that people with well-paid but highly specialised jobs, like lawyers, medical doctors, computer scientists, etc. tend to have above-average IQ, but rarely beyond what is considered exceptionally gifted (over 135). Their IQ is more likely to be between 110 and 130. According to a research conducted by Statistic Brain<, the average IQ of college graduates ranges from 103 to 133 - the highest average being for physics and philosophy majors, which do not necessarily lead to the better paid jobs. The highest salaries tend to be found at the higher levels of the business and political sectors and typically require good interpersonal or managerial skills, which are more linked to EQ and some other types of intelligence. Highly specialized professions with high salaries, such as lawyers, engineers or medical doctors, do not require IQs in the exceptionally gifted range. In fact, a lot of truly exceptionally gifted individuals wouldn't go into such specialized professions because that would limit their opportunities to satisfy their thirst for knowledge and understanding in other fields. Ironically that may be why a lot of deeply gifted people choose not to have careers and prefer to have a lot of free time to read, learn, think and write. Does a higher intelligence lead to success in life? Not necessarily. Many factors can be just as important, including the ability to work hard, motivation, dedication, ambition, social connections, one's socio-economic level while growing up, opportunities, acquired social skills, creativity, etc. It also depends what one means by 'success in life'. A lot of people would argue that no one is really successful without being happy.